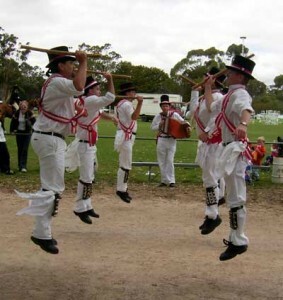 The Adelaide Morris Men » Blog Archive » What the heck’s a Moot Yang Gunya? What the heck’s a Moot Yang Gunya? About 10,000 years ago we danced at the Moot Yang Gunya festival in Mundulla, near Bordertown – not the remotest part of South Australia, but not exactly like nipping next door for a cup of sugar either. Many wizened discussions were had, such as the best way to trap a huntsman spider – white bread is the preferred tool for the job among the men, it seems. Our newest recruit has written a blog entry about the event here, which describes the event in words far more eloquent than the rest of us could ever muster.